This is an interview with Meera Patricia Kerr, who began studying yoga in the ’70s with Integral Yoga. She was playing in an all-female band in Connecticut, and used to go to Swami Satchidananda’s home for classes. Soon after meeting him, she went off for a 10-day silent retreat, met her future husband, and basically changed her life! Young and flexible, she became a yoga teacher in 1978, but her body went through so many changes during the next several years — getting pregnant, nursing babies, going through menopause — that she had to adapt her practice. Her new book “Big Yoga for Less Stress: A Simple Guide to Reducing Everyday Anxiety,” published in May 2015, continues her life’s work of showing people that you don’t have to be thin, young or flexible to enjoy the many benefits of yoga. Rob Schware, GBYF Executive Director: What originally motivated you to do this work, and what continues to motivate you? How, if at all, has that motivation changed over time? Meera: With my older, plumper body, I needed to get creative with the classical yoga poses, so I began adapting. Then I realized I wasn’t the only person getting fat! The gentle adaptations I was using personally became the groundwork for my first book, Big Yoga: A Simple Guide for Bigger Bodies. I continue to be inspired as I see people of all ages and sizes boldly coming to the practice of yoga. Is there a standout moment from your work with large women? When I began teaching Big Yoga, I was living in California and there wasn’t anything like it being offered anywhere. I wasn’t really sure of what it was going to look like, and I quickly learned from my students that we all carry our weight differently! So for every body, we look at what we can do comfortably, and work from there. As a trained Integral Yoga instructor, I have always taught a meditative class. The hatha practice is very calming to the mind and allows us to get comfortable enough to meditate. The goal of Big Yoga is overall well-being — physical health and a deeper connection to our inner life — rather than weight loss, although many of my students do experience this as a side benefit. Once I left California to live in Michigan, where I have a cottage along the lake, I had a hard time finding students who were committed to practice. There just weren’t the numbers of people interested in yoga out in the boonies. This made me realize the importance of my book and DVDs for home practice. It also inspired me to come spend more time at the ashram in Virginia. It’s a little challenging for a slender person to imagine how it feels to do a forward bend with a big belly in the way! In some of my teacher trainings working with “normies,” I would give them bubble wrap and tape so they could make themselves a “fat suit” to allow them to get a sense of what it feels like to have extra flesh in the way. My advice is to check in with folks — are they comfortable? What can we do to make you more comfy — sukkha, stira? I see more classes adapting yoga to every body. We’re not all built like Mister Iyengar! I’d like to see more yoga in schools too. I feel strongly about my mission of bringing yoga to the plus-size community — it’s my Karma Yoga, the yoga of service. Swami Satchidananda emphasized service as being key to any yoga practice, as a way of helping others, but also keeping the ego in check. My hat is off to Dr. Dean Ornish, who has pioneered the use of the yoga lifestyle to help reverse heart disease as well as other diseases. Dr. Michael Lerner has helped so much bring the healing power of yoga to cancer patients with his Commonweal Foundation. And Dr. Amrita McLanahan, who worked closely with both these innovators, is worth a mention. Another yoga pioneer I greatly admired is the late Mukunda Styles, author of Structural Yoga Therapy. And of course, my own Guru, Sri Swami Satchidananda, who had such a gift for bringing the ancient, sacred art of yoga into the secular western way of thinking, and making it accessible. Together, we can create change. 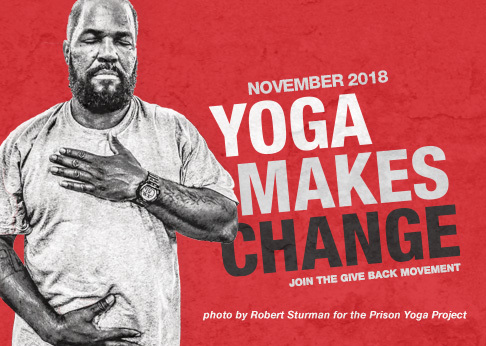 Watch our video to learn how yoga is changing the lives of those in need of transformation — and how you can help.